Emma West established her ceramics studio in 2000. What was planned as a career break from her work as an archivist soon became a full time passion. Although the world of historical manuscripts is behind her a sense of heritage and historical continuity filters through her work. 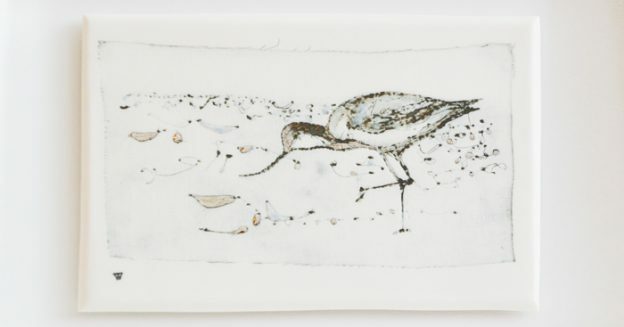 Emma’s style and approach to porcelain is sensitive, she has developed a creative technique focussing on surface texture and impression, using glazes to emphasize design. The use of textiles in Emma’s work is a relatively new departure. An embroidery ‘image’ is hand stitched, quite loosely, allowing threads to fall freely and give a ‘sketch’ quality to the piece. The embroidered cloth is then impressed into the unfired porcelain. At this stage various freehand marks are made in the clay altering each piece. Glazes are subsequently applied to reveal the imprint bringing the permanence of porcelain to the fragility of a stitch. Whilst the colour palette is not broad it is classic; gradations of blues, greens, greys and turquoise underpin the subtle detail of the surface line. For her latest works Emma uses platinum to give images a precious and sparkling but subtle look. All her pieces are one-offs as she can use the template cloth only once.